A “fish story” is often perceived as a tall tale, a narrative with “fishy” circumstances. If not an outright result of something incredible like “Jonah and the Whale”, a dubious stretching of the truth may be amusing but modern ichthyological science has somewhat tarnished the Egyptian tilapia legends. 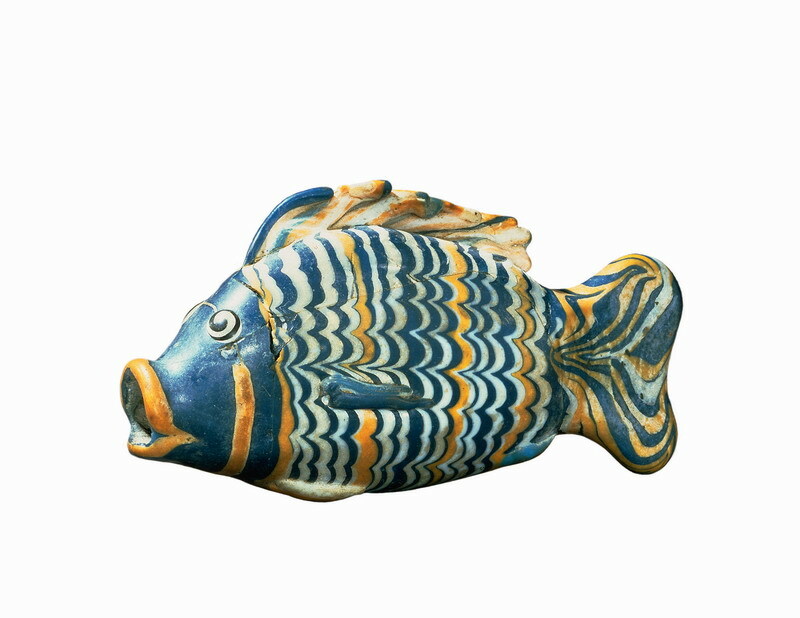 Amulets of the tilapia fish were perceived to possess fertility power as it was widely considered a symbol of regeneration and reproductive strength in Ancient Egypt. A description of the tilapia fish in Egyptian art mostly of the New Kingdom (roughly 1550-1070 BCE) follows, contrasted with scientific study of male tilapia virility. Although it is unlikely the ancient Egyptians were fully aware of all the particular tilapia traits, without doubt the species of Egyptian Tilapia (Oreochromis niloticus or Tilapia niloticus) was then and now famous for an unusual form of neoteny while rearing its young. 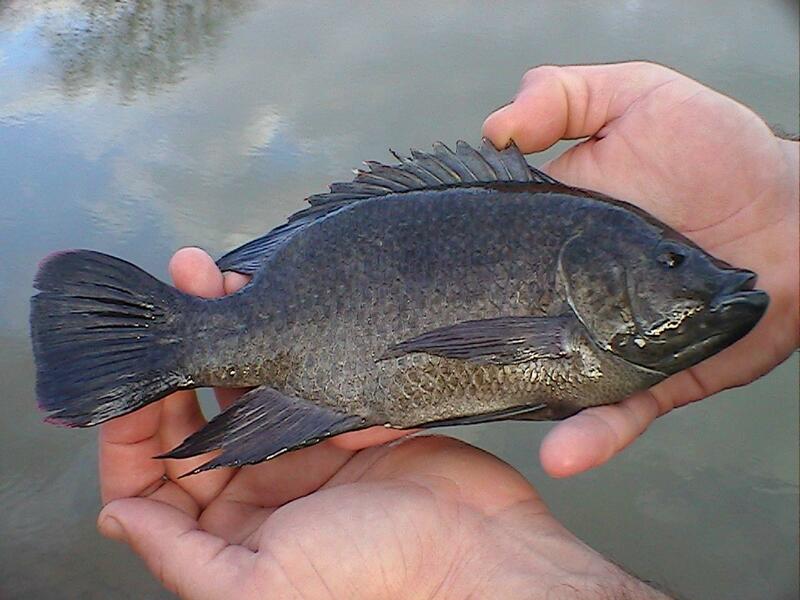 It is now well observed that the female tilapia carries her babies in her mouth after hatching, sheltering them from harm. How much Ancient Egyptians were aware of the emergence of the hatchlings from their mother’s open mouth remains to be seen. While more understood as a regenerative power, this unusual trait led Egyptians to exaggerate aspects of tilapia fertility, imagining this as a powerful rebirth tropism. Like modern fish aquaculture, Egyptians also farmed tilapia in closed ponds along the Nile, and this fish had its own special hieroglyph character as in.t (or ‘int) in texts  and the tilapia image was also worn as an amulet, not the least for pregnant women on necklaces or later sewn into shrouds for the afterlife. Greek historian Herodotus may have even tried to convey something of the parenting legends of the tilapia in his History II.93, although his information is somewhat garbled on Nilotic fish behavior. 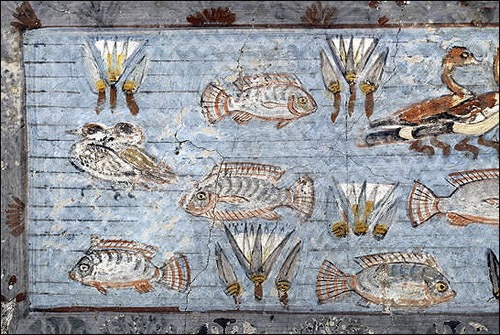 Ancient Egyptian gardens were also renowned for fertility aspects – perfect venues for lovers’ trysts as described in Egyptian love poems – and tilapia fish are also often portrayed in funerary wall paintings, e.g., swimming in the pools at the center of Nilotic gardens, as in the Nebamun tomb paintings from Thebes, one such image shown here. “One is surprised by the extremely small size of the testes when dissecting Tilapia. Even just before spawning these organs are often so small, that one wonders how these fish could fertilize an egg clutch. This contrasts remarkably with many teleosts in which ripe males exhibit a body cavity seemingly filled with milt…”  The author of the study concludes that tilapia are nonetheless rightly famous for parenting traits. In view of millennia of tilapia aquaculture, it’s likely good that Ancient Egyptians were mostly unaware of this possibly disappointing reproductive aspect of the fish story they told in art and literature: that their teeming Nilotic tilapia pools were more about successful parenting than regenerative and reproductive vigor. British Museum, Egyptian Antiquities # EA55193. Also see Douglas Brewer and Renée Friedman. 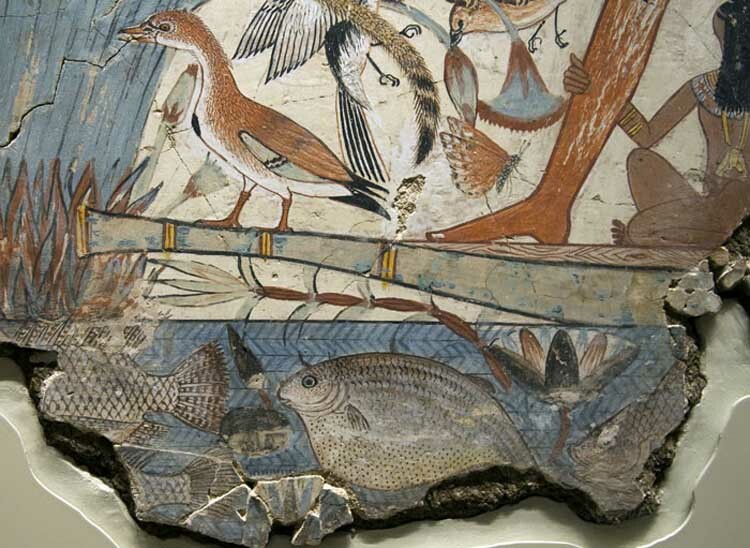 Fish and Fishing in Ancient Egypt. The Natural History of Egypt, vol. II. Oxford & Warminster: Aris & Phillips, 1989 (Cairo: American University Press, 1990). Barry Kemp et al. Horizon: Amarna Project and Amarna Trust Newsletter, Amarna Trust at University of Cambridge, vol.1, (2006) 3-4 (http://amarnaproject.com/images/downloadable_resources/horizon%20newsletter.pdf), (also note Horizon, 2012 issue 11: http://amarnaproject.com/documents/pdf/horizon-newsletter-11.pdf); Peter Brand. “Secondary Restorations on the Post-Amarna Period.” Journal of the American Research Center in Egypt 36 (1999) 113-34; Patrick Hunt. “King Tut’s Tomb: The Key to Egypt’s God-Kings” ch. 4. Ten Discoveries That Rewrote History. New York: Penguin/Plume, 2007, 82-3. M. C. Betro. Hieroglyphics: The Writings of Ancient Egypt. New York: Abbeville, 1996, 114. British Museum, Egyptian Antiquities, #EA 37983. Henry Salt Collection. Richard Parkinson, The Painted Tomb-Chapel of Nebamun. London: British Museum Press, 2008. Betro, 114; also see note 6 below for mention of 35 Predynastic fish palettes. W. M. Flinders Petrie, Prehistoric Egypt. London: British School of Archaeology, Egypt, 1920; also see Flinders Petrie’s Corpus of Prehistoric Pottery and Palettes, London: British School of Archaeology, Egypt, 1921, esp. figure page LV. Also see Francesco Raffaelle, Corpus of Egyptian Late Predynastic Decorated Palettes (http://xoomer.virgilio.it/francescoraf/hesyra/palettes.htm). In the latter (1921) Flinders Petrie monograph on palettes, Flinders Petrie has several pages (LIV & LV) titled “Corpus of Slate Palettes”; 38d-45u are 16 “fish” palettes on page LIV and the following page LV 46b-57h” shows 19 “fish” palettes, which he identified as “slate”; most of the 35 line illustrations are so stylized, generic and possibly somewhat fragmentary, like the image shown here, as to be likely unspeciable by ichthyologists. Scandinavian ichthyologist Svein Fosså (coauthor of Reef Secrets, 2003) suggests the image of this very early fish palette is difficult to identify as tilapia because it is very small and likely damaged and is therefore “uncertain…frankly looks more like another fish species.” On closer inspection it clearly lacks a dorsal fin although there are detailed lines where the full dorsal fin should be and it also lacks a distal fin and its caudal (tail) fin if complete also appears wrong. It also shows some fragmentary breaks along its bottom and other anomalies that may result from damage. British Museum Nebamun Tomb Paintings. For a singularly informative and well-written presentation on this painting and the original context, see http://www.ancient-egypt.co.uk/british%20museum/nebamun/index.htm for an excellent source of the archaeological context. along with Parkinson’s book mentioned above in note 3. Miriam Lichtheim. Ancient Egyptian Literature, vol. II, The New Kingdom. Berkeley: University of California Press, 1976 (2nd rev. 2006 ed. ), 44. Carol Andrews. Amulets of Ancient Egypt. Austin: University of Texas Press (for British Museum), 1994, 41 and fig. 43a. Ian Shaw and Paul Nicholson. The British Museum Dictionary of Ancient Egypt. London: British Museum Press / New: York: Harry Abrams, 1995, 100. L. R. Aronson. “Influence of the stimuli provided by the male Cichlid fish, Tilapia macrocephala, on the spawning frequency of the Female.” Journal of Physiological Zoology 18.4 (1945) 403-15, esp. 403 ff. Hans M. Peters. “Testis Weights in Tilapia (Pisces: Cichlidae).” Copeia: Journal of the American Society of Ichthyologists and Herpetologists, vol. 1971.1 (1971) 13-17, quoting page 13. Note: acknowledgments to Svein Fosså for his ichthyological assistance in order to keep this brief article from being a further “tall tale”/ “fishy” story.